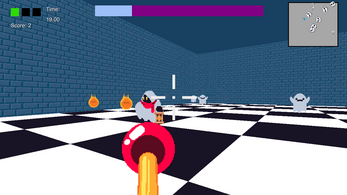 Danger Formation is a group based top-down shooter. Slime Hero is a strategic survival rogue-lite. itch.io Community » itch.io » Questions, Ideas & Feedback · Posted in Question: Anyone knows how to find a publisher for RPGMaker games? Maybe you'd have better luck looking at resources threads in the RPGMaker forums? So if one has newer releases that aren't discounted as much as older ones, one may want to do a sale/bundle with multiple titles at different discounts. Tried to do this withing itch.io's current sale system, did a bundle with all games at 10%, but bundled as the bundled price, and then another bundle with the deeper discount on the older title only. But itch.io's sales function only displays one bundle on the game page, so the ones that are in more than one sale (deeper discounted game A and game O) don't display the bundle with the lower discount at the top of the page. 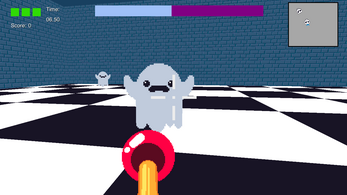 I've been working on a cute FPS where you fight a bunch of ghosties. You have to manage the tug-of-war battle between the light and dark energy that powers your weapons. You have a rapid fire light magic shot and a dark magic spread shot. Using your light magic makes your dark magic stronger and your light magic weaker, and vice versa. Juggle this with running around collecting power-ups and dodging attacks. Art and UI are placeholder. Any feedback on difficulty, fun, or bugs would be appreciated. I'm also open to game name brainstorming. itch.io Community » itch.io » Questions, Ideas & Feedback · Created a new topic Interact>Email --Option for an email template? For emails to buyers that are about game updates, a template function would be useful. These emails tend to be largely similar in structure, so if I could copy a prior email (or save a template) and just change the version number and the notes about what changed in the version, it could save some time. Enhance your swordplay with a variety of psi powers. Blast them away! Want a change of pace? 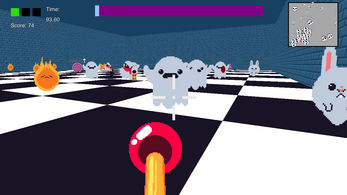 Play a round of Bug Boshers, a fast paced defense shooting game. Thanks for the info about sales, makes my life easier to set and forget, haha. When you get around to sales scheduling, it might be nice to have it integrate with the tool that e-mails prior customers, to say something like: "game you liked is on sale, maybe tell your friends to buy it, share sale link, etc." Have you seen the sales management page for Humble? It has a good selection of features. So I was setting up some seasonal sales after getting the sale reminder e-mail. But while setting them up, I noticed there aren't any options to customize the sale page, the way one would for a store page. It would be nice to customize to either make the sale page cohesive with the game pages or to add sale specific graphics, like seasonal backgrounds for seasonal sales. Autumn leaves, snowy drifts, icicles, hot cocoa, flowers, rainy streets with umbrellas, sandy beaches, that sort of thing. Being able to overwrite the sale title with a thematic banner would be great, too. An option to copy the page customization from one of the games/products included in the sale would be amazing, as it would save people time making all their pages cohesive. Font, bg image, colors, etc could all transfer over. The left hand side of the sale page could have identical settings to the game page, and the right side could have a darker/lighter bg. Tangentially, could we have a setting to schedule sale visibility? Right now the only way to keep a sale private until the start date is to keep it a draft, but I'm prone to forget to come back and set it live. Ex: Dev wants to have a simultaneous sale on itch.io to coordinate with other storefronts, but the dates of the sale on other storefronts is supposed to be kept private until it starts. If there was a third setting besides Draft and Publish, like a "Schedule" setting that would go live either at the start sale date or a customizable Publish date, then a dev wouldn't have to worry about agreements with other storefronts. I think it'd be cool if we could enable force projects to be "click to run." Especially if you know the file is big or intensive to run. They wouldn't get the instant satisfaction, if it isn't publicly visible right away. Maybe that would be all that's needed. Trying out the itch app this week. Pretty much the best way to try out a handful of cool free games in an afternoon. There doesn't seem to be a way to remove items from a collection, or to move them from one to another. I've got an Interested/try later collection, would like to move items to a "Games I've Tried" collection and add notes when I do. Kinda cumbersome to do in the app, as I can add each to the Tried list, but then go to the website to remove each item individually. Would like to have either a remove selection option or a move option, with the option to add notes when I do. I tend to add to my Interested collection in batches to try later, so it'd be useful if I could mark that as the default collection. It's my oldest collection, so I always have to click the dropdown menu every time I want to add anything to it. While I like the idea of diversifying tags on games, thus improving the search system, the Steam user-tag system is widely abused and often inaccurate. Since they display any user tag once it hits a certain number of submissions, users can basically graffiti the Steam page with tags that don't apply, to the detriment of future users and the devs. Perhaps users can submit tags, and once they're submitted a minimum of times, the dev gets a notification and can approve them if they apply? itch.io Community » itch.io » itch app Development · Posted in Where to put savegames? Since it's a file location set by Unity, it isn't possible for me to change the directory manually. While messaging how much they might make from posting affiliate links would be good for the affiliate, I can see it being sometimes undesired on the dev end. Primarily if they have it set to zero until they get into the black, it might become bad PR if [the info on revenue cuts] is spread around to the general public. An idea: if in the settings for itch.io cut, there was a sub bar for affiliate cut [not unlike the humble bundle devs, charity etc. sub bars] and if the affiliate bar is non-zero a tick box appears for if you want to display the affiliate revenue to affiliates. That way it's an opt-in process. Sort the Court! community · Replied to Ultra Runaway Games in Suggestions! Also it feels like it is mostly weighted towards saying Yes to most things, so it might be more interesting if there were more things that seem like saying Yes might be good, but that No is better. As a general governing rule, just making the decisions more difficult as you get further along. After the dragon comes, and you have money, it kinda gets easier in general after that. After you say no to the devil guy Georgie several times, I think it'd be good if his questions got more difficult or tempting. Later on (post dragon slyed, lots of money) he kept coming a lot but we kept telling him no and it lost what made the character interesting. Physics on coins would be cool, so that you could keep seeing more coins as you make more than 3000 gold. I'd also like to see the city in the background grow more.